Sector rotation is one of the more popular applications of momentum. There are research papers showing that industry momentum may be as profitable as individual stock momentum. Industry momentum through sector rotation strategies is also more implementable than individual stock momentum for most investors, has lower transaction costs, and fewer short-term tax consequences. 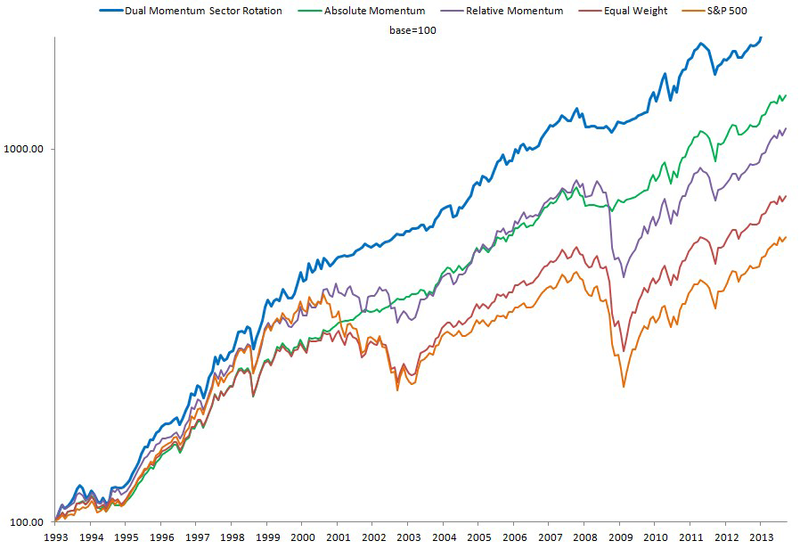 Keep in mind though that my first momentum research paper showed that momentum applied to geographically diversified stock indices outperformed industry sector momentum. Sector rotation may not perform any better than momentum using broad-market indices, but investors are more attracted to approaches like sector rotation having more moving parts. I find sector rotation interesting because it shows me what areas of the broader market are exhibiting the most.underlying strength, and this can be a harbinger of future market direction. For example, defensive sectors can show the best relative strength near market tops. The following chart shows sector rotation using relative, absolute, and dual momentum. The equal weight sector portfolio shows higher returns than the S&P 500 due to mean reversion profits from monthly re-balancing and equal, rather than capitalization, weighting across sectors. But results of both relative and absolute momentum are better than equal weighting. Absolute momentum has less volatility and lower drawdowns, even though relative strength momentum is more popular than absolute momentum. As expected, dual momentum shows the best performance from among these alternatives. Keep in mind that the performance of our Dual Momentum Sector Rotation (DMSR) model only goes back to 1993 due to the lack of sector data before then. Also, 2011 was a difficult year for sector rotation strategies owing to high sector volatility.